A portion of Interstate 40 in Central Arkansas smelled like a series of bad decisions on Thursday morning after fiery a crash involving two 18-wheelers spilled a massive payload of Fireball Whisky all over the roadway. Photos of the scene show hundreds of miniature bottles of the spicy, cinnamon-flavored liquor broken and strewn across the ground as if a raging frat party had been hit by a hurricane. The crash occurred around 10:45am (local time) in the westbound lanes of the roadway between Galloway and Kerr in Pulaski County, according to the Arkansas Department of Transportation. Investigators are working to determine the cause of the collision, which also caused one truck's cab to catch fire in addition to the boozy mess. At least one person was treated for non-life threatening injuries, per local news reports. Police and transportation officials faced a difficult cleanup process that involved bringing in a "mechanical broom." Meanwhile, traffic was delayed in both directions for several hours. "Looks like we’ll be working this for a while," the DOT said in a post on Twitter. Traffic didn't resume until around 1:30pm (local time). 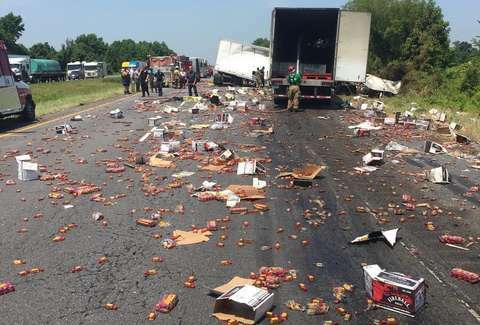 This, of course, isn't the first time a big rig crash has spilled some sort of foodstuff on a major roadway -- and far from the first incident of its kind in Arkansas. In August of 2017 alone, truck crashes spilled frozen pizzas, spaghetti sauce, and bourbon on roads in the state. The Fireball incident also joins a long list of similar food and drink spills, including Tito's Vodka, liquid chocolate, Busch Beer, cookie dough, and -- our favorite -- a combination of deli meat and bread. Tony Merevick is Senior News Editor at Thrillist and can only imagine the stench. Send news tips to news@thrillist.com and follow him on Twitter @tonymerevick.